The online version of this article ( https://doi.org/10.1186/s13046-019-1170-7) contains supplementary material, which is available to authorized users. Lung cancer is the leading cause of cancer-related death worldwide; moreover, nonsmall-cell lung cancer (NSCLC) is the predominant type, as it accounts for 80% of all lung cancers . The initiation of lung cancer is caused by a number of factors, including genetic alterations such as mutations in K-Ras, epidermal growth factor receptor (EGFR), anaplastic lymphoma kinase (ALK), phosphoinositide 3-kinase (PI3K), and BRAF [2, 3, 4]. 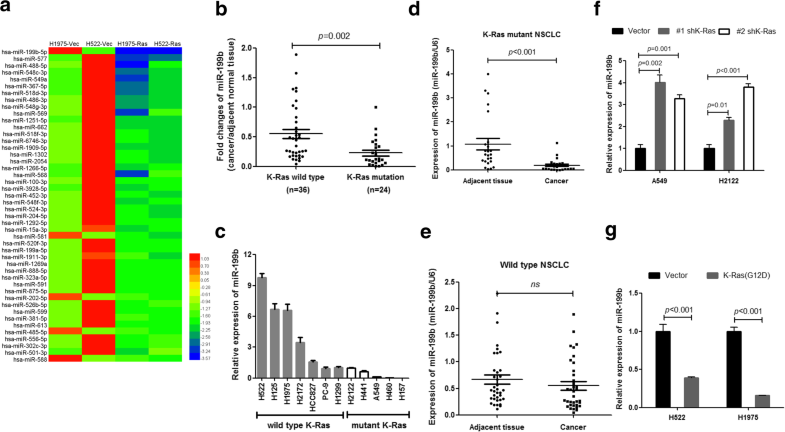 Among these, K-Ras is the most frequently mutated oncogene found in NSCLC, 29% NSCLC patients have K-Ras mutation . 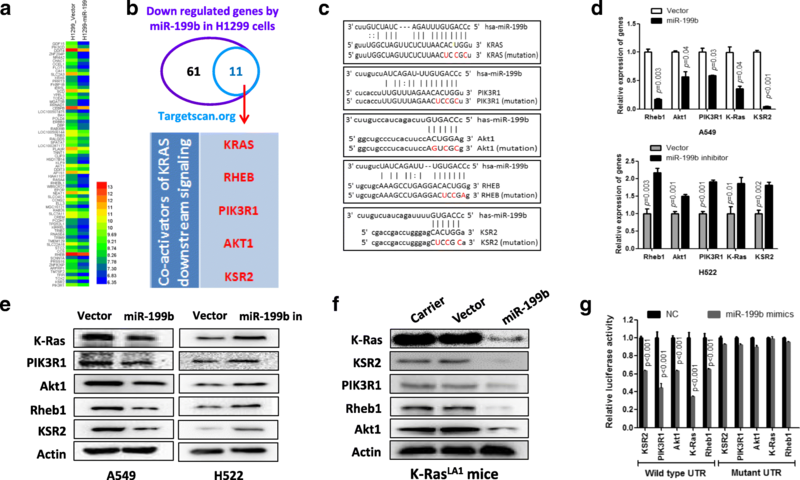 Notably, K-Ras mutations are not only related to cancer initiation; they also promote cancer progression, like metastasis  and therapeutic resistance  Thus, K-Ras is a high-priority therapeutic target, but despite the decades of effort, no targeted therapy is clinically available for K-Ras-mutated cancers . 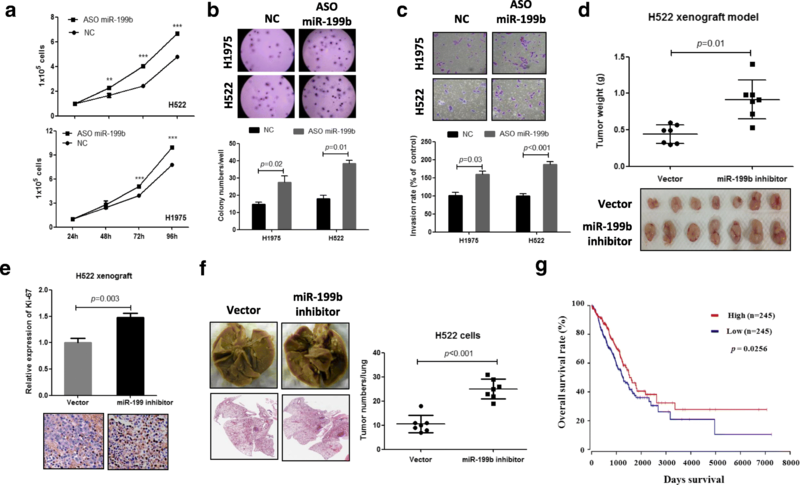 Finally, we elucidated the mechanism by which miR-199b inhibits the Akt and ERK signaling pathways in NSCLC cells. Recent studies have shown that one single miRNA plays its role through strongly influencing a specific signaling pathway by simultaneously targeting multiple components of that specific signaling pathway. For example, Fang et al. 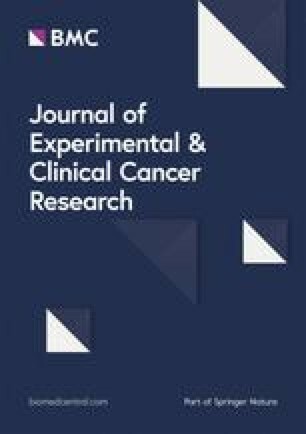 reported that increased miR-582-3p expression induces lung cancer recurrence through activating Wnt/β-catenin signaling by simultaneously inhibiting multiple inhibitors of Wnt/β-catenin signaling, such as AXIN2, DKK3 and SFRP1 . Lin et al. 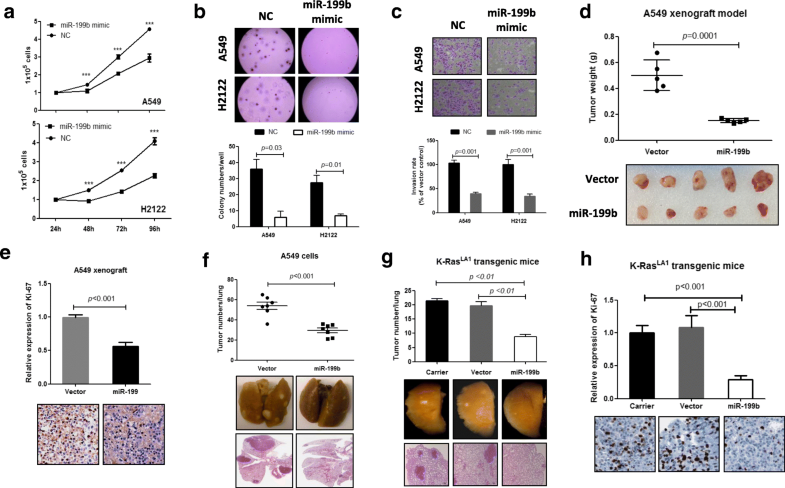 reported that miR-135b activates the hippo pathway by targeting multiple key components of the pathway, including LATS2, NDR2 and LTS1, to significantly stimulate lung cancer metastasis . 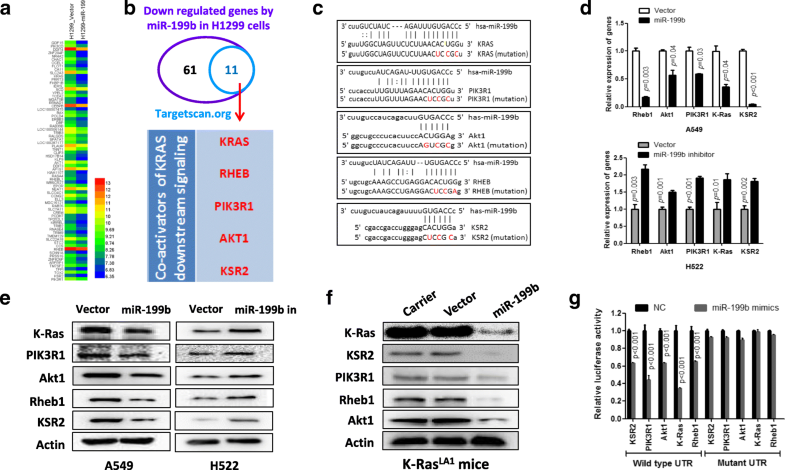 Here, we identified a series of novel target genes of miR-199b that belong to PI3K/Akt and ERK signaling pathways, including K-Ras, PIK3R1, Akt1, Rheb1 and KSR2. K-Ras is an upstream regulator of PI3K/Akt and ERK signaling, and mutations in K-Ras lead to the activation of these two oncogenic pathways in NSCLC . 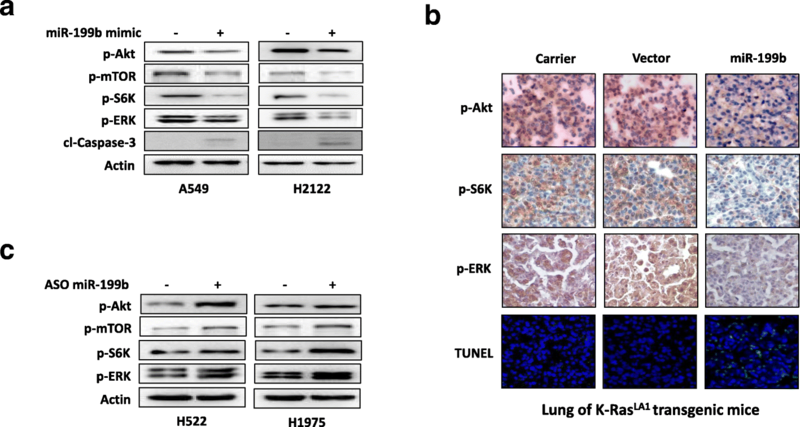 PIK3R1, Akt1, and Rheb1 have been identified as important components of PI3K/Akt signaling activation, and they have been suggested as therapeutic targets in lung cancer treatment [12, 30, 31]. 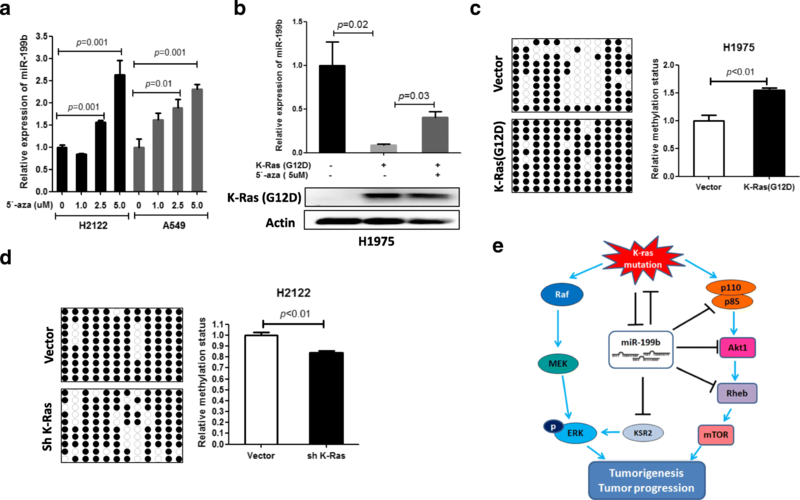 Finally, KSR2 is an activator of ERK signaling [32, 33, 34], and its overexpression stimulates tumor cell transformation . These findings suggest that miR-199b inhibits the PI3K/Akt and ERK pathways by simultaneously inhibiting a number of their activators.